So we've covered the plot, the characters, the genre, and even the hero's journey. Let's continue to dig a bit deeper. Every film starts from a script. Every action, every word, perhaps even some of the shots, are written out before a scene is ever put on film. This document has a large impact on what will be shown on screen. And while we don't go to the movies to look at a script, it's influence is present. It is the document that inspires the director and the entire crew to produce what we see. Most of the time you can't read the actual script, but you can still notice it. How was the dialogue? Was it fast and witty? Were there lots of pauses, or was it contemplative and philosophical? How were the transitions in between scenes? Most of this might not be from the script itself, but perhaps it was. How were characters developed? Were there any clues that might have been given early on about what would happen later? Again, in the finished product, it can be hard to discern how much was left to the writer and how much is determined by the later craftsmen to better tell the story. Sometimes what works on paper doesn't work on-screen. On the film I recently edited, Persimmon, the script was very different from the finished product. However, it wasn't a different story. The themes it dealt with and the characters it created were still very much the same. Just because the order of scenes was changed, does not mean that the script was gone or useless. It was the genesis of the film, and just revealed itself differently because of the changes in the visual storytelling. What can be helpful in seeing how this works, the relationship of script to screen, is to read a script yourself. Pick a movie that you know well, grab the script and read through it. See what is different, or even things you notice that you didn't notice when it was on-screen. As you begin to explore the differences from word to film, it can be very illuminating on what the director chose to highlight and what he didn't. 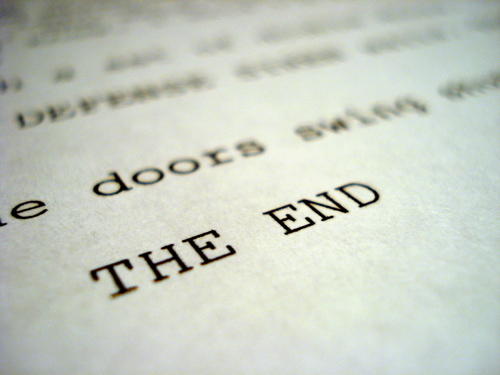 Grab a script of a movie you are familiar with. If you don't have a script, look at Drew's Script-O-Rama. You should be able to find at least one you've seen before. Read through the script and note how the pacing and rhythm of the film comes through the words. Note where changes were made. See what stands out in reading it versus writing it. If you need help discerning why the script is written the way it is, or want to write your own, I would recommend checking out this book, The Hollywood Standard. It will explain a lot of why things are they way they are and is pretty accessible. Comment below with your thoughts as usual!